WE’RE BACK WITH A NEW FRIDAY FAVE, IT’S BEEN QUITE SOME TIME SINCE WE’VE SHARED ONE OF THESE! 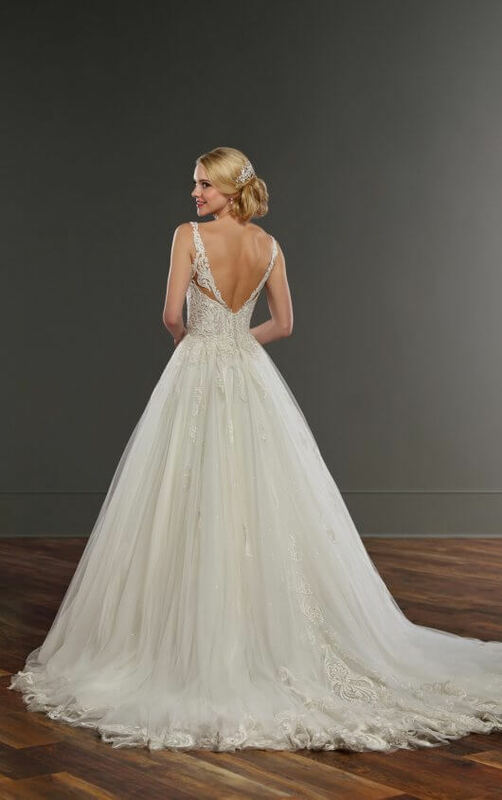 WE’VE HAD SO MANY NEW GOWNS ARRIVE THAT WE’VE FALLEN HEAD OVER HEELS FOR – SO IT’S BEEN HARD TO PIN POINT A FAVORITE! MARTINA LIANA GETS US EVERY TIME WE OPEN UP A SHIPMENT, HER DETAILING ON EACH GOWN STOPS US IN OUR TRACKS! So what makes this beauty our new favorite? Easy, we’ll break it down for you below! The center of the bodice really brings an art deco feel to this gown that differentiates itself from its sister gown in the Essense line. The circular pearling in the center really concretes that feel! With a whole underlay of clear sequins this gown certainly shines! Towards the end of the train the appliques begin to thicken with lattice work detailing. We are big fans of that checker boarding action! We were full with layered tulle skirt ball gowns needing another gown with a straight textured skirt. Much like needing a basic in your own closet and finally finding the perfect one you just feel that satisfaction! So, how did we style this exquisite gown? We wanted to really show off this headpiece and chose the dress around this headpiece (which is not how it should be, fall in love with your dress first***). We selected a nice tear drop earring we have a soft spot for and simple yet striking gold bracelet to create a full look. To allow the bodice of the dress to speak we brought the headpiece towards the back of the head instead of the crown. Versatile pieces like this one are truly great when you are unsure of how you are going to do your hair on the wedding day. Because there is so much detailing going on in this gown we decided to pop in a raw edge veil that gathers so sweetly. This veil is a personal favorite because of the way it cascades down the back with two layers of tulle. We look forward to sharing more faves with you Bella Babe!